It’s been more than I expected it would be–for instance, I actually learned how to bake!–but the le sauce baking academy is wrapping up soon. At least it is in its current form, however, given my almost-comfortable comfort level when it comes to all things involving flour, you will definitely see baked goods from now on here at le sauce. I’ve learned how to make bread, the best pizza dough, light cakes, oil cakes, every kind of pastry (with success! to my surprise) and more. I’ll have a round-up of the highlights for sure, and you can bet we’ll be ending with a bang. For now, all I can tell you is that we’re rounding out the lessons with how to make cookies, but you’ll have to keep an eye out for the grand finale! size matters, it turns out. The 6-inch cookie allows for a soft centre, a chewy but crisp edge with caramel flavour and the “ring” between where the flavours and textures combine. But as you can see above, a baking sheet can hardly contain 6 of these generously-sized cookies (I weighed mine for accuracy). They bled into each other while baking so mine were a glorious mess by the end. I’m no cookie-making expert but I’ve consumed a few in my day. All I can say is that these are definitely the cookies I’d put out for Santa…and there’s a little hint in there about the finale! Make sure to check back for the wrap-up, and please do share your cookie-baking tips and links to your related posts in the comments here. Thanks to all for sharing your learning and contributing to the le sauce baking academy! 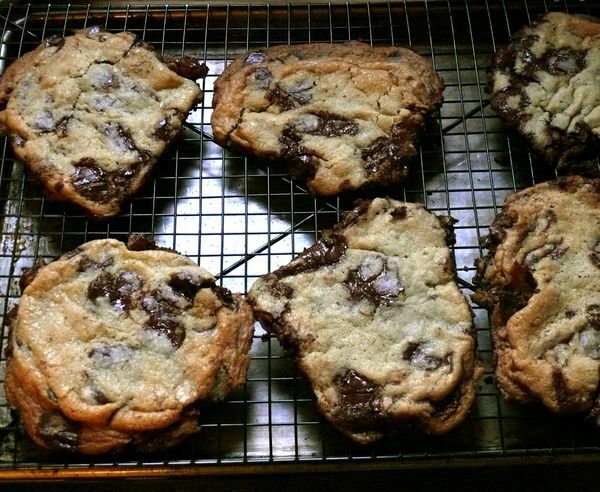 NYT note: Time: 45 minutes (for 1 6-cookie batch), plus at least 24 hours’ chilling. Note: Disks are sold at Jacques Torres Chocolate; Valrhona fèves, oval-shaped chocolate pieces, are at Whole Foods. YS note: I couldn’t get my hands on chocolate discs so I went with the best chips I could find. I found the first two weights confusing (why site identical weights but not identical measures?) so I went with careful measurements for the cake and bread flours. There are no notes about using room temperature butter but I did for ease when creaming them. Makes 1 1/2 dozen 5-inch cookies. Oh man were these tasty! Thanks for sharing with us! The salt really tied everything together. I love these cookies but when I want cookies I want them NOW! Not 36 hours later. The good thing is that you can slice the raw dough, individually wrap them and pop them in the freezer so that you can always have cookies at the ready.